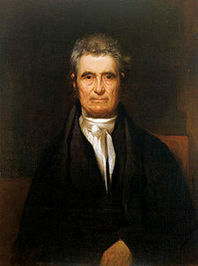 John Marshall was an American statesman and jurist who shaped American constitutional law and made the Supreme Court a center of power. Marshall was Chief Justice of the United States, serving from February 4, 1801, until his death in 1835. He served in the United States House of Representatives from March 4, 1799, to June 7, 1800, and, under President John Adams, was Secretary of State from June 6, 1800, to March 4, 1801. Marshall was from the Commonwealth of Virginia and a leader of the Federalist Party. The longest serving Chief Justice in Supreme Court history, Marshall dominated the Court for over three decades (a term outliving his own Federalist Party) and played a significant role in the development of the American legal system. Most John Marshall was an American statesman and jurist who shaped American constitutional law and made the Supreme Court a center of power. Marshall was Chief Justice of the United States, serving from February 4, 1801, until his death in 1835. He served in the United States House of Representatives from March 4, 1799, to June 7, 1800, and, under President John Adams, was Secretary of State from June 6, 1800, to March 4, 1801. Marshall was from the Commonwealth of Virginia and a leader of the Federalist Party. The longest serving Chief Justice in Supreme Court history, Marshall dominated the Court for over three decades (a term outliving his own Federalist Party) and played a significant role in the development of the American legal system. Most notably, he established that the courts are entitled to exercise judicial review, the power to strike down laws that violate the Constitution. Thus, Marshall has been credited with cementing the position of the judiciary as an independent and influential branch of government. Furthermore, Marshall made several important decisions relating to Federalism, shaping the balance of power between the federal government and the states during the early years of the republic. In particular, he repeatedly confirmed the supremacy of federal law over state law and supported an expansive reading of the enumerated powers.